This is Librarian, so we'll talk in a whisper! 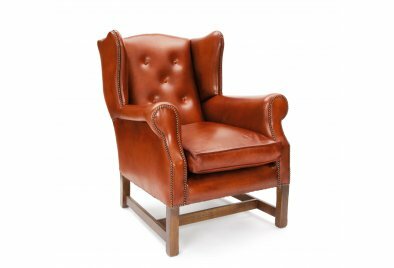 He's a true Leather Wing Chair but you may also know him as a Leather Wingback Chair. He's got a hand-buttoned back, a pair of fine wings and a pair of sturdy rolled arms, oh and I did I mention how comfy he is, he's just the perfect Leather Reading Chair isn't he? His seat is properly sprung with a lovely inviting cushion on top. It's leather piped all the way round and has a foam core to keep its shape, with a layer of duck feathers on top to make it extra friendly and soft. Shhhhh - quiet please! To meet Librarian's fellow winged friends please click here!